SALEM, Ore. — The Oregon Department of Fish and Wildlife has formally recognized Hamilton Construction Co., a contractor for the Oregon Department of Transportation on the OTIA III State Bridge Delivery Program, for environmental enhancements in rebuilding the McKenzie River bridges on Interstate 5 near Eugene. 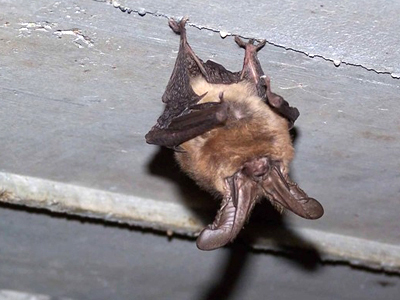 During a pre-demolition inspection, inspectors found colonies of Townsend’s big-eared bats in both the northbound and southbound bridges, part of Bundle 215, I-5: McKenzie River (Spores) to Goshen Grade. The bat is a state sensitive species and a federal species of concern that uses cavernous spaces such as the old McKenzie River bridges for habitat. Since the new bridge design lacked open cavernous spaces, ODFW staff was concerned that the bats would likely abandon the site. To address the concern and come up with a cost-effective solution, ODOT’s construction project manager, Tim Dodson, pulled together a team comprising David Leal, U.S. Fish and Wildlife Service; Simon Wray and Jim Muck, ODFW; Kristine Marshall and Brian Nicholas, David Evans and Associates; and Brian Bauman, Oregon Bridge Delivery Partners. Together, the team members designed, approved and developed an inexpensive, innovative bat box design for use between the I-beams of the new bridges; ODOT agreed to monitor these boxes to determine the amount and type of bat use. If successful, these efforts will not only maintain a valuable roost site for Townsend’s big-eared bats but also result in a bat box design that can be used on other bridges across the state. In addition to the bat boxes, Hamilton proposed an environmental enhancement to protect spring Chinook salmon and winter steelhead, both native to the McKenzie River and both listed as threatened under the federal Endangered Species Act. The company removed 800 yards of riprap—hard rock used to protect embankments from erosion—from around the existing bridges. This action will allow the stream to move naturally within the floodplain under the bridge and improve rearing conditions for the fish. It is well above the requirement to meet the fluvial performance standards of the new bridge design. Townsend’s big-eared bat is identified as a species in need of help in the Oregon Conservation Strategy. See ODFW’s website for more information. The OTIA III State Bridge Delivery Program is part of the Oregon Department of Transportation's 10-year, $3 billion Oregon Transportation Investment Act. OTIA funds will repair or replace hundreds of bridges, pave and maintain city and county roads, improve and expand interchanges, add new capacity to Oregon's highway system, and remove freight bottlenecks statewide. About 17 family-wage jobs are sustained for every $1 million spent on transportation construction in Oregon. Each year during the OTIA program, construction projects will sustain about 5,000 family-wage jobs.